This week the Foundation Stage children have been learning about the months and seasons. On Tuesday the children talked to a partner about what they had been doing during the hot and sunny bank holiday weekend and then the children wrote their weekend news during an adult-led activity. 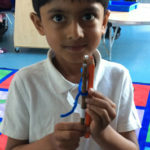 During their independent learning the children were supported to make their own Stick Man using sticks, googly eyes and pipe cleaners. At the end of the day the children listened to the Stick Man story and talked about the different adventures Stick Man went on during the book. On Wednesday the children ordered the months of the year, learnt a months of the year song https://www.youtube.com/watch?v=5enDRrWyXaw and engaged in a whole-class discussion about how many months there are in a year; which month we are in now; which month we will be in next; which month their birthday is in; and we talked about what the weather is like during the different months of the year. The children were challenged to use their Stick Man to find classroom objects which were longer than, shorter than or the same length as their Stick Man. It would be wonderful to see the children demonstrating this at home and for parents to upload these observations onto Tapestry. This week’s PSHE discussion focused on feeling lonely and what the children could do if they saw someone looking lonely, which led on to a discussion about how to be a kind friend. The children have enjoyed watching the Stick Man animationhttp://www.dailymotion.com/video/x3ki25z during this week’s story times. Wednesday’s adult-led activity focused on sequencing the Stick Man story, in addition to this some children wrote which season linked to each picture and some children wrote about what Stick Man did for the different seasons, e.g. In Winter Stick Man was used as a snowman’s arm. On Thursday morning the children recapped their previous learning about the four seasons and looked at which months were matched to which season. Following this the children had to guess which season was being revealed by looking at parts of a picture and then the children matched picture clues with their corresponding season. Thursday’s learning challenge was to write a letter to the stick family from Stick Man asking for their help to save him from his adventures. Before lunch the children acted out the rhyme ‘15 Little Stick Men’ and discussed there being one less each time and counting back. During Thursday’s adult-led activity the children were asked to write about an adventure Stick Man could go on next. It was great to see the children using their imaginations to think of new adventures. We have been supporting the children to use their phonic knowledge to spell words, use finger spaces between their words, using full stops at the end of their sentences, starting sentences with a capital letter, reading what they have written to check it makes sense and trying to sit their letters on the line. Throughout the week it has been excellent to see the children’s writing abilities progressing. On Friday morning the children explored the concept of addition using Stickmen. The children used their fingers to count on and find out how many Stick Men there were altogether. Friday’s learning challenge was to draw a map of Stickman’s adventures and to write annotations on their map to explain what is happening in their pictures. Before lunch the children explored the concept of addition and counting on using number lines. This week’s handwriting has focused on the letters b, n, h, r and j. The children have been learning about tricky words and have been reading the words the, to, no, go, he, she, we, my, me, was. It has been fantastic to see the children starting to use common irregular words (tricky words) in their writing this week. 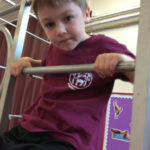 During this week’s PE the children acted out Stick Man’s adventures using apparatus e.g. 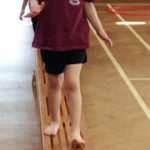 balance along a bench; climbing table with a mat to jump onto; log rolls on a mat; weaving in and out of cones with a bat and a ball; climbing on apparatus. The children ended their PE lesson by playing sleeping sticks. In ICT this week the children have been using 2Simple 2Paint a Picture to draw a picture of Stick Man and his family. In addition to our busy week the children have been engaging in a variety of activities during their independent learning. Some of which include: Writing about their favourite season; making mini-books; writing tricky words on the chalk board outside; adding with sticks; counting natural objects outside; dress Lecky game on Interactive Whiteboards http://www.crickweb.co.uk/Early-Years.html; cut and stick dress a child for the right season; creating suns and clouds to hang in the outdoor area; exploring the giants castle role play area; investigation table – looking at tadpoles, chrysalis, sunflowers and cress; Stick Man story tray; building a house for Stick Man and his family using sticks; ordering sand castles by height; bottles and funnels in the water tray; painting a seasonal picture; painting with sticks outside; and looking at different Julia Donaldson stories in the reading area.